It’s a happy day here at the Delicious Brains virtual office, we’ve just released version 1.2 of the Multisite Tools (MST) addon for WP Migrate DB Pro! Since MST 1.1 you’ve been able to drive a migration between a multisite subsite and a single site install of WordPress from the multisite. We’ve had many requests for being able to drive such migrations from the single site install, which is an important feature when said single site install is behind a firewall and can’t be reached by the multisite. It took rather a lot of work, but with MST 1.2 you can now pull a subsite into a single site install as well as push to a subsite. Didn’t believe this would ever happen? Well, prepare to be amazed and watch my awesome demo video below to see a standard single site install of WordPress drive a migration from and to a multisite subsite. There are a couple of other bug fixes for MST also bundled in this release. Along with the new release of Multisite Tools there is a bug fix release of WP Migrate DB Pro and compatibility releases of its Media Files and CLI addons. Of particular note are a couple of fixes for the import feature that was introduced in WP Migrate DB Pro 1.8, such as better support for SQL files that have been manually gzipped on the command line, and cleaner switching from import to other migration types in the UI. As always you can see all the changelogs on our site. Hope you enjoy using this latest release of WP Migrate DB Pro and its addons, please post any comments on this release and feature requests for MST in the comments section below. Not a WP Migrate DB Pro customer yet but like what you see? 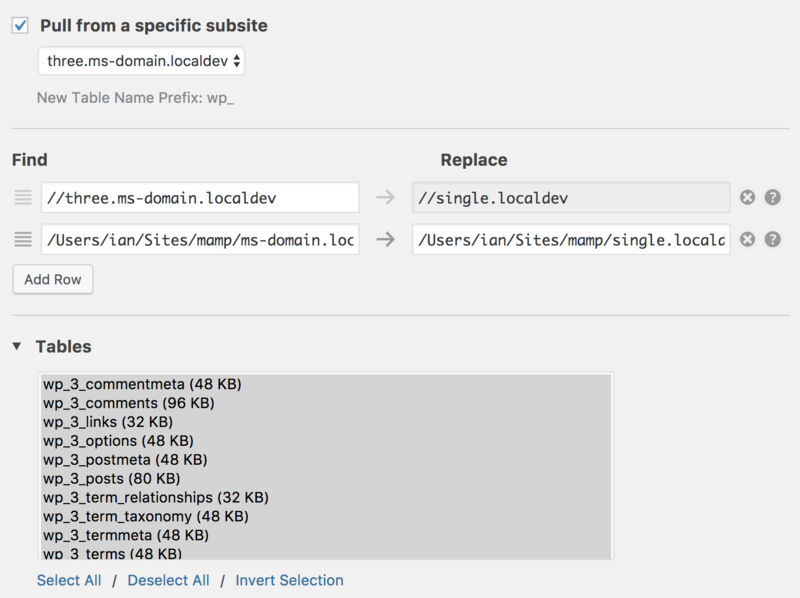 Get WP Migrate DB Pro with the Multisite Tools Addon at the Developer License and above. This entry was tagged WP Migrate DB Pro, New Release, Multisite Tools Addon, WordPress Development.